Visions of Sonwai is truly an art book, as stated in the review in the November 2008 issue of Voices Heard, the Journal of the Heard Museum. The book features more than 125 pages of beautiful Sonwai jewelry, wonderful prose by Annie Osburn, and truly amazing poetry by James A. McGrath. 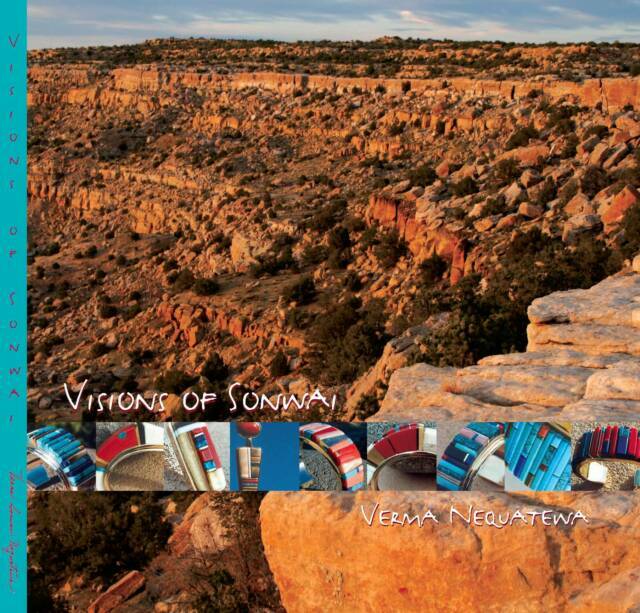 Annie Osburn has known Verma for more than 20 years and spent some time visiting with her in her home and studio on Hopi. Annie did the writing and coordinated the production of the book. Annie is a free-lance writer and has written numerous books and articles on artists, native-American artists, and many other areas. James A. McGrath is a Living Treasure of Santa Fe. As one of his artist friends stated, "He is a living treasure of the universe!" He created poems specifically for this book. James was good friends with Verma's uncle, Charles Loloma, having worked with him at the Institute of American Indian Arts in Santa Fe and spent more than a year at Hotevilla, on the Hopi Reservation, visiting with Charles and Verma while teaching at Hotevilla-Bacavi Community School. For the past four summers, James has taught for The Hopi School, Inc. and visited with Verma. He has great understanding of Hopi. The book comes with a striking red silk slip cover and is a welcome addition to any collector's library. At $85, the book will give hours of enjoyment to artists, collectors, and those just trying to understand more about Hopi. A few limited edition books with the silver cast maiden pendant are still available at $875. See the contact page to see where to get a copy, or contact Sonwai via email at rwrhodes264@gmail.com.